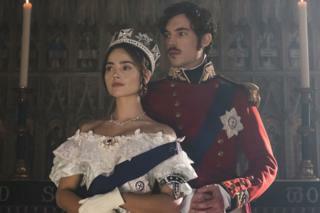 ITV's royal drama Victoria is back, with Jenna Coleman as the queen, Tom Hughes as her husband Albert, and an unexpected dash of contemporary resonance. President Trump's announcement that he is sending more US troops to Afghanistan marks the beginning of yet another chapter in America's longest-running war. "Writing this show is extraordinary," says Daisy Goodwin, the show's creator and executive producer. "There are times it feels like you're writing it in the present. "The series starts in Afghanistan and ends with a vote about free trade. It feels like nothing has changed since the 1840s." The second series begins with her cradling one baby in her arms. By the time it ends, she will be onto baby number three - of nine. "She has been in confinement since the birth of her child, so she is not in the best of tempers," remarks lead actress Jenna Coleman. "She's learning to navigate her new life as a mother and keep her hands firmly on the crown. Such a balancing act leads to inevitable fireworks." It doesn't help that Albert has a stubbornly independent streak and is itching to be more than just a loyal and supportive consort. "Albert's journey in the previous series was about him trying to find some freedom of expression and identity," says actor Tom Hughes. "In this series, there's a strengthening of his will to pursue those ideas and be at the forefront of the Industrial Revolution." As their impressive progeny shows, Victoria and Albert were very much in love. But that didn't stop them occasionally being at loggerheads. "I think of them as being like Elizabeth Taylor and Richard Burton," says Goodwin, referring to the legendary Hollywood power couple of yesteryear. "We imagine Victoria and Albert as this idyllic couple, but they were always having the most incredible rows. This was not what you would think of as a Victorian marriage." "With arguments it's about shooting quickly and keeping it spontaneous," she told an audience in central London. "The quicker we shot an argument scene, the better." "You can do as much research as you like, but if it's not on the page it's never on the screen," said the Chester-born performer. "Magic happens by accident - it's never anything you can bottle." The connections continue with the casting of Dame Diana Rigg as the Duchess of Buccleuch, a disapproving matriarch highly reminiscent of the one Dame Maggie Smith played throughout Downton's six series. "We were so thrilled she agreed to come on board," smiles Goodwin. "I was basically writing Lady Bracknell [from The Importance of Being Earnest], and there was really only one person to play her." The veteran actress, she continued, "brings a certain asperity to the screen and the set" and insisted on a bottle of Prosecco at the end of each day's shooting. "She drinks one glass and shares the rest with the make-up ladies," says Goodwin of an actress whose casting as Victoria's Mistress of the Robes follows her role as Olenna Tyrell in HBO's Game of Thrones. Victoria may lag behind that show in the blood and thunder stakes, but there's no doubting audiences have taken it to their hearts. Dame Judi previously played Victoria in 1997's Mrs Brown, as did Emily Blunt in 2009's The Young Victoria - another dramatisation of the sovereign's early years. "It's a great escapist treat but it's also a mirror to our times," says executive producer Damien Timmer when asked to account for the continued appeal of period dramas about the great, the good and the regal. "We relate to the life we see and the fact that human nature fundamentally doesn't change."